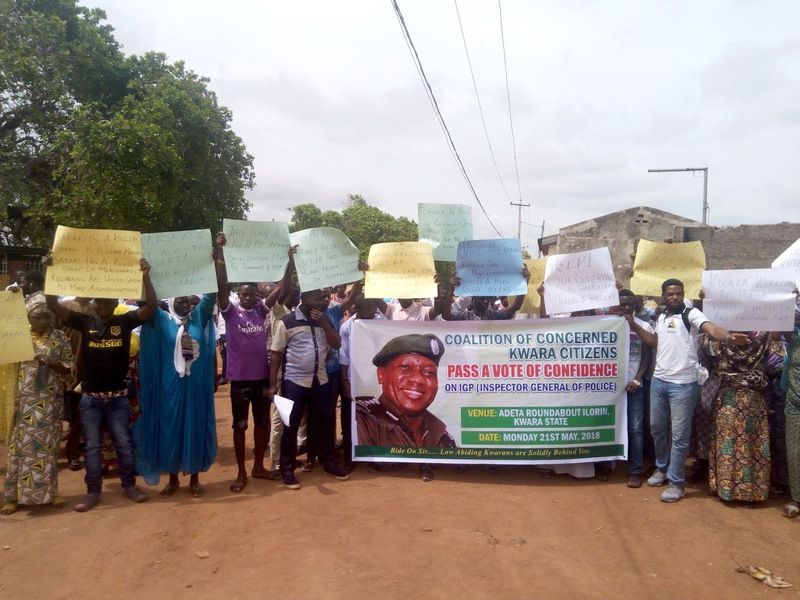 Being the address of the COALITION OF CONCERNED KWARA CITIZENS on the controversy surrounding the case of some cultists that was transferred from Ilorin to the Police Headquarters Abuja for further investigations. Distinguished gentlemen of the press we welcome you to this press conference which is the first by coalition of concerned Kwara citizens. Ordinarily the issue for today would have been different but for the circumstances of fate. The trending issue in the affairs of our State Kwara today is the arrest of some cultists that have allegedly confessed to the killing of some Kwarans in the State and outside the State from 2014 till date. Ordinarily, this issue would not have been of great concern to the public but for the outburst of the Senate President on the floor of the Senate on Wednesday 16th of May 2018. Just because the suspects were transferred from Ilorin to Abuja for further intensive interrogation, the Senate President alleged that the Inspector General of Police was about to implicate him on the commission of the crimes by those arrested. Many see the outburst as an attempt to use the power of the Senate to intimidate the Inspector General of Police and thereby obstruct the thorough and proper investigation of the crime. will be left to face the wrath of the law. Secondly, the State Governor convened an emergency security meeting and raised the alarm of the possible implication of him and the Senate President on the alleged crime committed. Thirdly, the Kwara State House of Assembly has passed a motion on the inappropriateness of the transfer of the suspect and the case to the Police Headquarters in Abuja. In solidarity with their sinking leader, the caucus of the Kwara State members of the House of Representatives has also risen against the transfer of the matter to Abuja. Some misguided youths have been poured into Kwara Streets chanting songs of solidarity in favour of their leader that may have aided murder of some Kwarans. There is this genuine fear by the coalition of concerned Kwarans that if we fail to talk, the whole world shall have no option than to believe that Kwara is populated by criminals or cowards who are on the same page with the above motley assembly aiding and abetting crimes. Senator Saraki has for long thrived on blackmail to evade police investigation and prosecution. This is not the first time Senator Saraki and his supporters would use blackmail and insinuation to pervert the course of justice. In 2012, he was jumping and running away from police SFU invitation on account of his alleged involvement in some fraudulent issues in the affairs of Intercontinental Bank. We do not see anything special in the movement of culprits to Abuja for diligent investigation. It is only instructive to note that this is not the first criminal matter that would be transferred from Kwara to Abuja. In the wake of 2003 election that ushered in the administration of Senator Saraki as Governor spurious allegations were made against some prominent Ilorin indigenes on plans to bomb Senator Saraki’s National Pilot Office along the stadium road Ilorin. The case was investigated by a senior police officer in the rank of DIG from Abuja and the matter was subsequently moved to Abuja. Similar cases that were transferred to Abuja from Kwara include the Fulani/vigilante group crises in Alapa, Asa Local Government Area of the State, the Offa Poly Students/OPC and Oro-Ago Fulani/Farmers crises were examples of cases that were transferred to Abuja. indeed live like kings. Recently, they were provided with Toyota and Lexus cars on which they proudly displayed the name of Saraki or APC as their plate numbers of identity. They are on the pay roll of the government and enjoy all forms of protection from the authority of the State. If indeed they have confessed to killing people and they are set free all the time, proper diligent investigation prosecution will certainly reveal their sponsors. We therefore urge that the best place to do proper justice to this case is Abuja. Though the DPP of Kwara State and the Deputy Chief Registrar of the Kwara State High Court have been enlisted to help the Senate President and his crony Governor on the need to transfer the case back to Kwara for prosecution; the two of them may not have the minds of their own as they are in the employment of the State government. We also believe that the two should know that the fact that the filing of the first information report (FIR) has been done, does not mean that the case cannot be compromised by the Government of Kwara State. The Director of Public Prosecution (DPP) can still decline prosecution through a spurious legal advice or even the Attorney General of Kwara State can at any stage of the trial enter a nolle proseque to terminate the trial. The best is to take this case from the hands of those that can compromise diligent investigation and prosecution. Abuja is the proper place of investigation even if the trial will be done in Kwara State. On the involvement of Kwara State Judiciary, we appeal to Judiciary not to allow itself to be used on matters that are outside its purview. We also call on Chief Justice of Nigeria (CJN) to caution the leadership of Kwara Judiciary not to dabble into matters that do not concern the Judiciary.